Physical / My baby is not crawling, what can I do? Before your baby learns to walk, he’ll need to practice two very important things: balance and leg strength. By crawling your little one practices balance, coordination, and strengthens his arms, legs, and core muscles. He also learns the ability of shifting his body weight from side to side. If you think you have a non-crawler in your hands you can try practicing these exercises to foster these abilities. 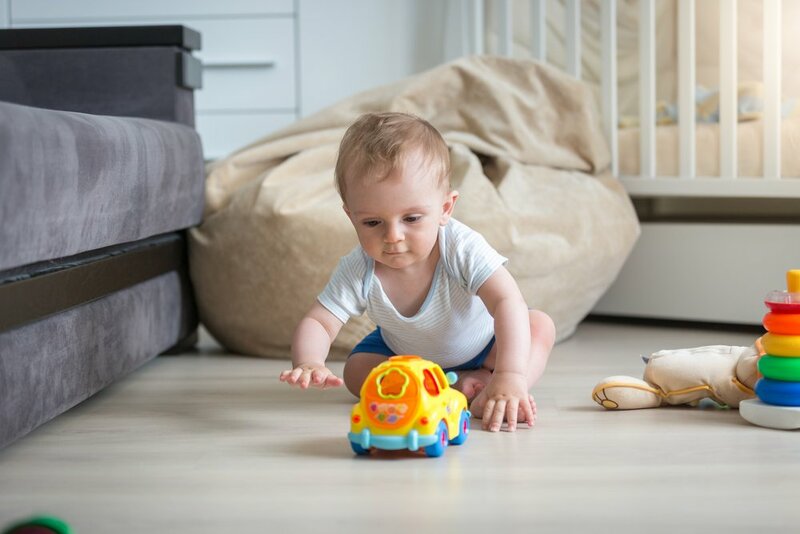 Reaching for attractive toys and noisy objects is an important exercise where your baby practices the weight shifting and balance he needs. Make sure you give him plenty of opportunities to do this and keep challenging him by placing the toy a bit further every time. Place a couch cushion on the floor and help him explore it by placing toys on top of it. As he reaches for the toys, he’ll strengthen his muscles and stabilize his hips to bear weight on both sides. This is essentially the movement of crawling. It will also help him get ready for later on pulling himself up to a standing position. Place attractive toys to each side when playing sited. As you encourage him to twist and reach for the objects, he’ll learn he needs to shift his weight over to one side to place both hands on the floor or object. Use a soft surface or carpet for tummy time. The soft fabric will motivate him to put his weight behind and press into his knees and hands. Practice tummy time on the floor with comfortable clothes or just in diapers. Make sure the room is not too cold for your baby and try playing belly down. The slick floor will give him and extra grip when moving arms and legs and will keep strengthening them. Belly crawling is not obligatory, but it is a method your baby might feel comfortable with. And, in most cases, belly crawling appears just prior to changing position to hands and knees. Sit on the floor with your son and place an attractive toy on your other side, encouraging him to crawl over you to reach it. You can slightly push his legs and trunk for him to reach the object. If he feels comfortable, try encouraging him to play with the toy while his belly rests on your legs. This way you’ll help him with some of the weight and still encourage him to reach while on a hands and knees position. He will work on his balance, weight shifting, and will strengthen his legs, arms, and core muscles. Get down on the floor and try it out with him. Your baby will feel more support once you see things from his point of view. Use smiles, make eye contact, and utter words of reassurance to encourage him to approach you. Keep it up! The important thing is that your baby is able to explore his surroundings on his own and that he keeps strengthening his body in preparation for walking and achieving other important milestones. If you feel your child is not moving normally, discuss your concerns with the pediatrician. My baby is 8 months old and isn’t crawling yet—is this typical?